Rapid Transit Continued - Living with my Glasair III. 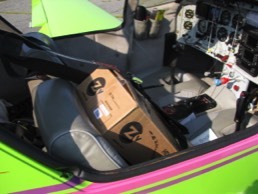 It's been more than 6 years since I acquired the Glasair III. 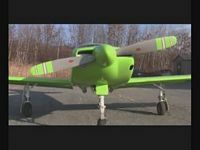 The construction of my RV-8A slowed to a crawl. I ended up selling it after several years of fooling myself, telling myself I would ‘get back to it real soon’. I have progressed from a crush to a long-term affair with the speedy green machine. It took probably a solid year of flying to truly get the hang and feel competent. Now, getting into a C172 feels like getting into a '57 Chevy - a step into the past. I can't even imagine puttering around with my wings in clay, like a Cessna feels with its huge control movements and glacier-like response. The last time I tried landing a 172 I did the usual Glasair thing of adding a touch of power to cushion the flare and floated for half the runway. You can never take the G3 for granted. It is a rewarding, but very demanding, plane to fly. Let the speed drop on final, and the sink accelerates quickly. Carry too much power on short final and it'll float, then plunk, and your passenger will wonder if you're new to this game. But when things are clicking just right, it's magic. SPEED: I usually do my traveling at 23-squared. This gives me about 225-230 knots TAS at 8000'. You can firewall it for another 5 to 7 knots, but fuel burn goes up disproportionately. ACRO: I love to roll and it does too. Big 'ol barrel rolls are joy. Usually pull back to 20" manifold and around 170knots. Slow or fast rolling is a kick either way. Always hold at least 0.5 a positive G, though, or it'll puke oil all over the belly. Immelmans are a little more demanding. Half cuban-8's work nicely, but it's too easy to lighten to 0 G on the rollout. I do NOTHING with an overly aggressive down-line, like a split-S or even a full loop. It just accelerates too fast, and the stick forces go up very quickly. I have the extended tips, so 3.5-4 G is the limit for pullout, which can consume a lot of sky on the down side without more strenuous G loading. My favorite is kind of an aggressive half chandelle thing - I am sure it has a name. Pull up to about 65 degrees and start a gentle roll one way or another as the speed bleeds to about 150 knots. When the wings are just past 90 degrees, pull through until the nose is pointed down on the reversal and then roll back the opposite direction while pulling out. Your speed and altitude should be about the same as the entry with the heading 180 from starting. Cool, cool, cool. Positive G, big altitude excursion up and down, rolling horizon, and fun. ECONOMY: I have GAMI injectors and can, and do, lean past peak on long cross-countries when I can really fiddle with the mixture and watch the temps like a hawk. Doing so will get me down to 12.5GPH. It does cost 15 knots, though. Most of the time, if the CC is short, or the flight is local, I will run 40 ROP at about 16GPH. Cooling has never been a problem. At 23 squared with 16GPH, the highest CHT is about 350 and the hottest EGT is around 1350. Slow scenics are fun, too. Pull the power to 15", the RPM to 2000, and putt along at 150knots at 8-9GPH. me to get current and develop a set of power and speed numbers to allow flying approaches and follow procedures. It was a TON of work. My currency has long since lapsed. The primary problem was SLOWING DOWN. Many of the approaches to smaller airports have pretty aggressive step downs. The Cardinal was a breeze to work down the steps without getting out of hand. This thing is just too damn fast. Point the nose down and it will accelerate. The alternative is to slow way down before you start down and drop the gear and hold 140MPH or less. That allows better control of the speed, but you're really dragging it along with a lot of power and a high deck angle and it just feels uncomfortable. At those speeds the stick forces are very light and you have to be dead-nuts on. I never did it in the soup. I have accepted that my Glasair is a VFR machine for me until I can dedicate much, much, more practice time on procedures and currency. 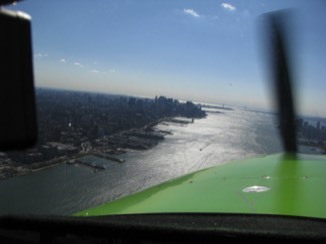 Flying the Hudson VFR corridor. I love he fact that this is still open. It's gotten a little more complicated since the Teterboro helicopter/Piper collision. Still, it's one of the more recommended flights in the Northeast. Gotta remember to slow to <140knots. Basically power down to the bottom of the green and prop to 2000. It helps with two people to fly and watch/listen. 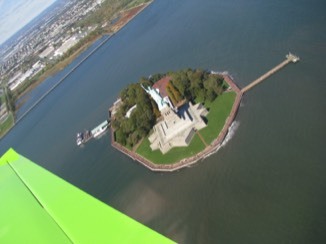 This is one of my favorite views of the statue. AND there's only one way to get it. Watch out for the swarms of helicopters in the summertime. Check the web. There's a protocol for fixed wing at one altitude and direction, and rotary wing in the opposite at a different one. Self-announce and be extremely vigilant. No more mishaps or this priviledge will disappear like so many others. Occasionally I actually get to use the plane for work travel. The Rivers Casino in Pittsburgh is a customer of ours. This is perhaps one of the most expensive forms of package shipment there is. It's a quick 2 hour flight from Fitchburg to KAGC. When I first started flying we had a rule: "If there is a kid on the ground, there is a parent on the ground." Simple protection against bad things. The effect of this was that we either ALL went out, or Lee, my wife, didn't go. The net effect of this was that she never went flying with me, since the number of times we all were going together somewhere was... well, never. 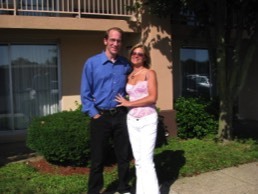 Since the kids are now both basically adults, we have relaxed that rule and have now started traveling together. To my surprise, she actually likes it. The rock start treatment the Glasair 3 gets when we arrive at FBOs doesn't hurt either. In Williamsburg, we literally got the red carpet, usually reserved for jets, rolled out for us. 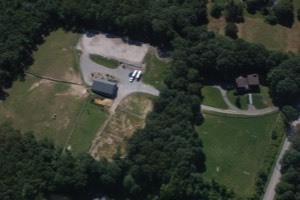 My old house and barn from about 500'. We sold it and moved out in 2010. It was a nice setup for small hobby farm or riding school. With Lee scaling back pony operations and the kids off in college it's way more than we need, so it's time to scale down. The new home specs involved WAY less maintenance, small, comfortable, and has a luxuriously appointed and comfortable shop/aircraft factory. In the last several years I have covered a lot of ground in the G3. Most of it has been within a 100 mile radius of KFIT, the home base. Short hyperactive flights with some light acro thrown in are just the ticket in most cases. I took a work colleague, Oscar Purwin, up for a short flight and he brought his HD video camera. This short video excerpt of the flight is obviously not HD, but still pretty big at 10MBytes or so. Careful before you click. Oscar passed the test. He is not a puker. There's nothing worse than a puker in a small cockpit.